Loctek FP1 Exercise Stepper Mini Step Swivel Elliptical Trainer by Loctek at DCJ. MPN: 8241600. Hurry! Limited time offer. Offer valid only while supplies last. Description: The Mini cardio stepper operates on two Hydraulic cylinders that create a stepping motion. Less jarring on the body than treadmills. The Mini cardio stepper operates on two Hydraulic cylinders that create a stepping motion. Less jarring on the body than treadmills. Improve circulation at the office during your break or use while watching TV at home or office. And the counter won't be hard to see or miss steps. Having this extra feature provides the opportunity to get a lot more leg and thigh muscles in shape, particularly the outer and inner thighs. The twist stepper machine has the same sturdy base as an ordinary mini stepper and as you'd expect, two foot pedals that twist slightly. 6. A portable Elliptical machine with built-in resistance training. ● weight capacity: 220 lbs. ( 100kg). ● overall dimensions: 17" x 16" x 11"
As you become fitter you can increase intensity to burn about 600-700 calories in a 40 minute workout. 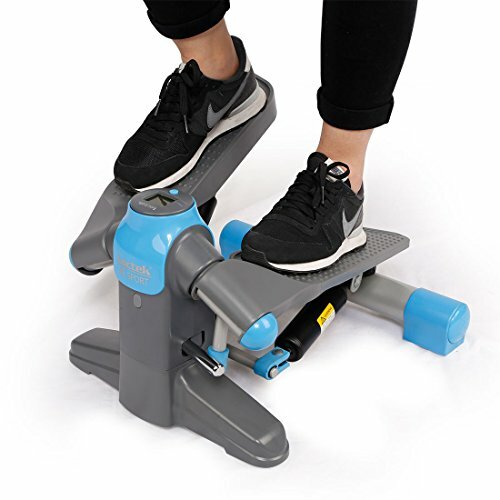 Mini steppers provide a great workout for very little money while you are considering buying a stair stepper, not only save money, but also space saving.17" x 16" x 11", when you finish exercise, you can put it in corner or under your table. The low impact mini steppers will ensure that your joints and muscles are not injured during the workout, a good cardio workout to lose weight. 220 lbs weight capacity. 20 mins a day exercise with Loctek twister stepper can get your blood circulation accelerated and keep you suffer from that kind of lacking exercise health disease, help you with cardiovascular and heart health. If you have any questions about this product by Loctek, contact us by completing and submitting the form below. If you are looking for a specif part number, please include it with your message.